Nothing new. 1954 sr. Mary At st joseph school, ACTS, adoration, contrition, thanksgiving and supplication essential to all our prayers. Father – As they say, it may be an oldie, but a goodie. And classics never go out of style. But from time to time, they need to be brought back out and shared. Thanks for stopping by! You are right. Using RAPT or ACTS, let us pray for the world and each other. I was taught “ACTS” in the middle of the last century too. Glad to see the general concept getting some attention. It’s too easy to focus on just one of those components – be it C or S depending on the day. Good review. I read this book earlier this year, loved it and have been using RAPT as the framework for my morning prayer since. One issue I did have it , though, is the Adoration section. In his book Kreeft calls Adoration the most important part of your prayer, to wich i agree.. 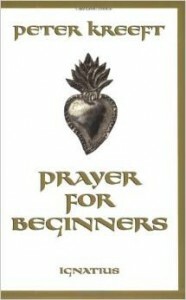 But he gives the least amount of guidance on HOW to Adore Christ in prayer. So I came up with my own way. Thank you for sharing YOUR way of adoring the Holy Trinity . I might add it to my own. Long time listener to you podcast…..God Bless! Perfecto Greg – thanks for sharing something I will take home to my family tonight! Jacqui – I’d be curious to know how your family likes it. My all time favorite book on prayer. I’ve had my copy since 2006 or so (with original monastery price tag 😉 ) and it’s traveled the world with me. I love the best-decade of notes I’ve made in the margins as I reread it frequently. Laura – Like me, you probably appreciate those random times when you stumble upon a Monastery price tag. I miss being able to drive over there on days of greatest need. I really like this. I’ve been trying to use this since you posted it. Thank you. Hi Greg! I thought I was doing pretty well with praying and then I read this article. One word sums it up- FANTASTIC! I found that I can go much deeper in prayer and it feels more complete. Thank you for posting this!!!! !